Numerical typhoon simulations using nonhydrostatic global atmospheric models demonstrated improvement in predictability of tropical cyclone track and intensity, according to a research led by Dr. Masuo Nakano and Dr. Ryo Onishi at the Japan Agency for Marine-Earth Science and Technology (JAMSTEC: Asahiko Taira, President) with Dr. Hiromasa Yoshimura at the Meteorological Research Institute of Japan Meteorological Agency. The team conducted 137 sets of 5-day simulations on JAMSTEC’s supercomputer, Earth Simulator, using three 7-km mesh global nonhydrostatic atmospheric models and a conventional hydrostatic global model with horizontal resolution of 20 km for comparison. In prediction of tropical cyclone track, errors usually become larger as the forecast period extends. In the simulations, each three model reduced systematic errors by 5-20%, or 26% in the averaged result of all the three. 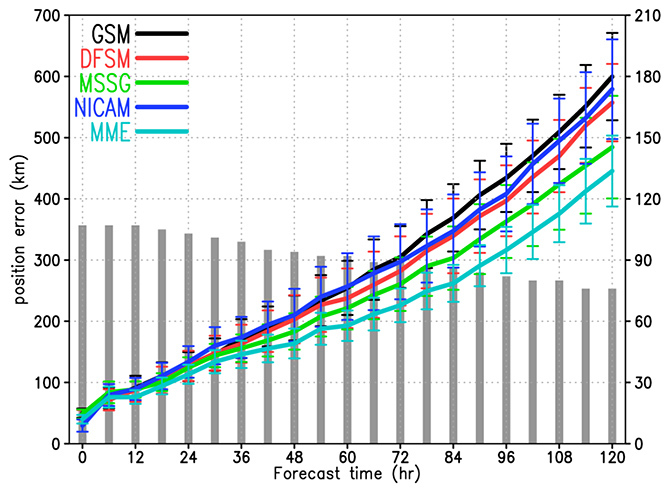 It means that the range of systematic errors in 5-day forecast by 7 km mesh models has almost been equal to those in current 4-day forecast by 20 km model. Moreover, prediction of typhoon intensity has also improved in two of 7-km models. Recent advances in high-performance computers have facilitated reasonable operation of global models with horizontal grid intervals less than 10 km, though practical application of such models still require further development. These results will contribute to build better weather forecasts especially for tropical cyclones that could cause tremendous damages by violent winds and torrential rain. Utilizing big data obtained from Himawari-8 & -9 satellites observation, the scientists will continue more detailed analysis to realize tropical cyclone prediction as accurate as possible. The above results were posted in the Geoscientific Model Development by European Geosciences Union on March 31, 2017 (JST). Figure 1. 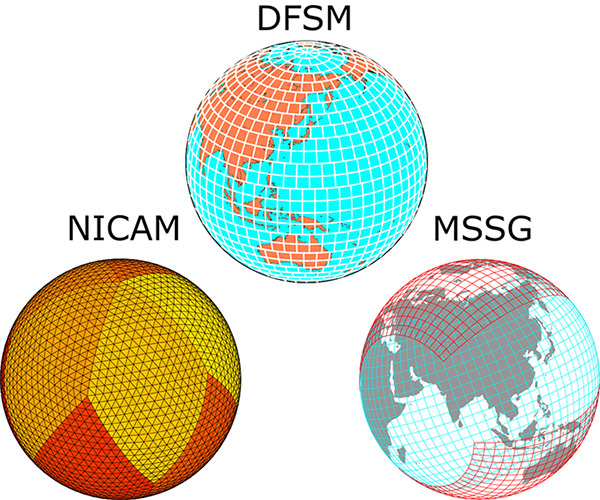 Schematic diagram of horizontal grid structures of three models used in this study: the nonhydrostatic global spectral atmospheric Model using Double Fourier Series (DFSM); Multi-Scale Simulator for the Geoenvironment (MSSG) and Nonhydrostatic ICosahedral Atmospheric Model (NICAM). Figure 2. 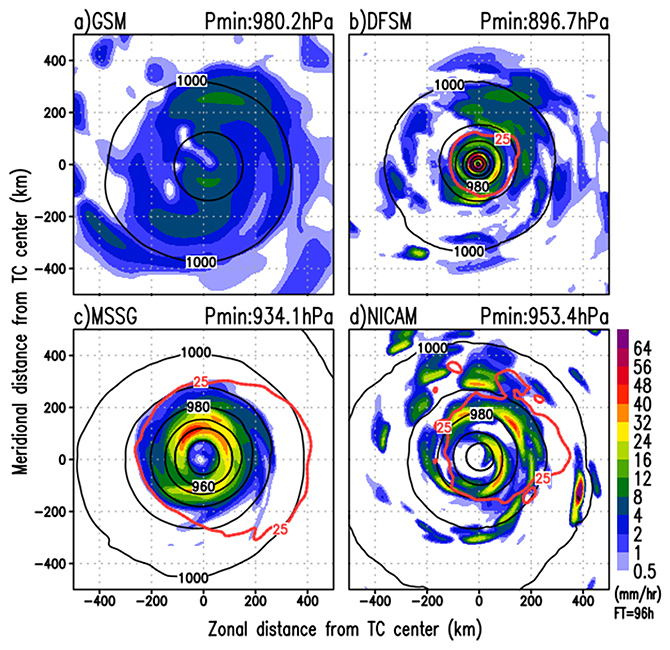 Errors in track prediction by the conventional 20 km-model, Global Spectral Model (GSM) of JMA, and three 7-km mesh models: DFSM, MSSG, NICAM. Errors are smaller in the three 7-km models, and even the smallest in the multi-model ensemble mean (MME) applied to the three 7-km mesh models. prediction and JMA best track. Figure 4. 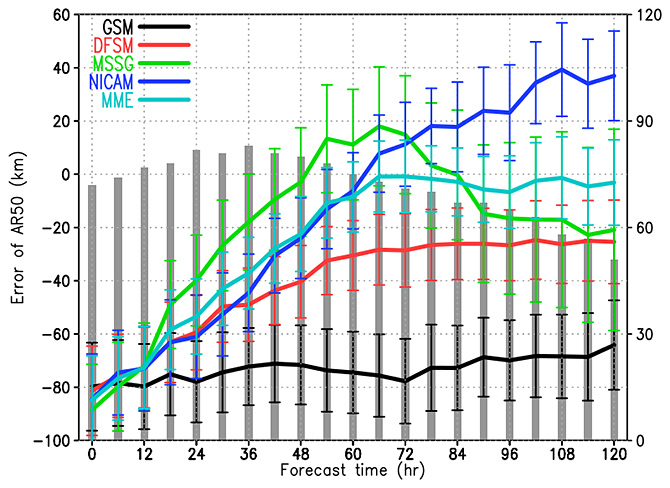 Errors in prediction of storm areas where wind velcoity exceeds 25 m per second in GSM, DFSM, MSSG and NICAM. The gray colored bar graph shows the number of cases (as shown in the right axis). At 0 hr of forecast time, the three 7 km models already understimates the radius of storm area less by 80-90km. 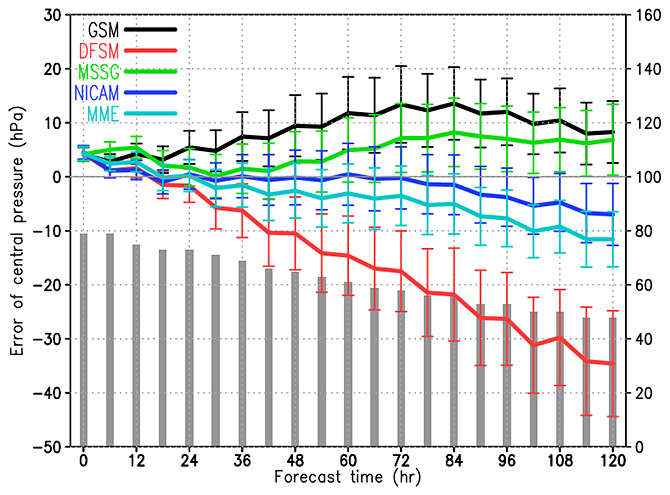 The 7km model tends to reduce initial errors while GSM does not. It is, therefore, necessary to improve the initial values. Figure 5. Horizontal distributions of precipitation (coloured), sea level pressure (black contour) and wind speed (red contour) for Typhoon Wipha at 6:00am on October 10th, 2013 (UTC) with forecast time of 96 hours (four days). The analyzed maximum wind speed is 40 m per second with the storm radius of 220 km. Compared to the GSM, the 7 km model predicts stronger rainfall. Predictions of storm areas, and distributions of precipitation and wind velocity of 25 m per seconds also differs largely.